How does a receding hairline start? Hairline recession is a variable, but for most men, an inevitable part of the aging process. Approximately 50 million men suffer from male pattern baldness or thinning hair. A man has a 50 percent chance of experiencing hair loss by his 50th birthday. By the age of 35, two-thirds of American men experience some degree of measurable hair loss, and by the age of 50, approximately 85 percent have significantly thinning hair, according to the American Hair Loss Association. The presentation will vary from one man to another as it is closely tied to one’s unique genetics (androgenetic alopecia). Hair loss is typically heralded by a change in the quality of the hair with thicker, coarser, terminal hairs ceding ground to thinner, softer velus hairs. This is initially seen in the temples but with time will extend to the forehead hairline terminating in a V-shaped “widow’s peak.” In more advanced stages, the hairline will continue its march backward towards the crown sparing the androgen insensitive ring along the sides and back of the scalp. A man will often have questions as to how this phenomenon will manifest in his particular case. And the best recommendation is to shake the family tree and see what falls. Examining hair loss patterns in one’s family (grandfathers, fathers, male siblings) can often yield clues as to what the future holds. When did their hair loss begin? End? How do you compare currently to where they were at your age vs. the present? While this is no guarantee of an outcome, it can often be a helpful guide. Once hairline recession has begun (or is anticipated), the next question is typically what can be done? Treatments for hair restoration can be divided into preventative and restorative (and the 2 are not mutually exclusive). Preventative treatments will include non-prescription grade topicals aimed at scalp health (Hairmedica), oral supplements and prescription grade (Minoxidil and Finasteride) medical therapy as well as PRP (platelet-rich plasma) and LLLT (low-level light therapy). All of these can also be used for both preventative and restorative purposes and each has unique +’s/-‘s. However, the pinnacle of restorative hair medicine is FUE. The Neograft FUE method of hair transplantation involves the harvest of individual hair follicles from the scalp in their naturally occurring groupings of about 1-4 hairs with subsequent replacement in the areas of the scalp where balding has occurred. NeoGraft generally has a greater than 90% take rate, thus ensuring a discrete solution to hair loss, allowing patients to achieve natural looking results with no linear scar, minimal downtime and a shorter recovery period. How many grafts will I need for my receding hairline? When planning a hairline restoration, “natural” is the operative word. The goal is to establish a “natural” i.e. age appropriate hairline in a patient who has reached a stable hair pattern. This position is usually determined by dividing the face into equal thirds with the upper border of the upper third (brow to hairline) defining the new restored “front.” Depending on the patient this will require upwards of 1000 grafts. Irregularity and “natural” will be included in the design with single hair FUE’s separated out and preferentially placed at the forefront. Hair restoration is a continuum and there is no single “magic bullet.” There are, however, a number of tools at your hair restoration specialist’s disposal to provide a natural and long-lasting result. For anyone with concerns surrounding hair loss or with interest in hair restoration, seek out a well-trained board certified practitioner with experience in hairline design who can incorporate the latest medical and surgical modalities. 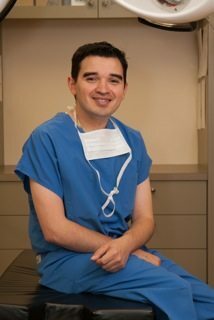 Dr. Donovan Rosas, M.D. is a Board Certified, Ivy League educated, fellowship trained plastic surgeon. His expertise spans the whole of cosmetic and reconstructive surgery. He proudly joins IAS and enthusiastically brings his experience and expertise to the Orlando area.